Peanut butter has been around for ages, but now it has competition from other nut butters such as cashew butter and almond butter. You have probably heard that nuts are good for your heart health. But are the newer and more expensive nut butters any better for you than peanut butter? Is it time to switch from PBJ sandwiches to ABJ or CBJ? Nutrition information shows that almond or cashew butter may be a little bit better, but not by a lot. Here are the facts about these three types of nut butter. Peanut butter is an excellent source of protein and monounsaturated fatty acids, and it has some magnesium, potassium, selenium, and a few B vitamins. One tablespoon of peanut butter has 94 calories, 4 grams protein, and 8 grams of total fat. Almond butter has a bit more total fat than peanut butter, but that includes more monounsaturated fat and about half the amount of saturated fat. Almond butter also has more fiber and fewer carbohydrates, so it has about the same number of calories as peanut butter. Almond butter has more minerals than peanut butter, with the exception of selenium. Peanut butter contains more B vitamins. Cashew butter also has the same number of calories and fat as peanut butter, but less protein and more carbs. Cashew butter has more iron and magnesium than peanut butter. Cashew butter also has a bit more monounsaturated fat. Peanut, cashew, and almond butter all contain phytosterols, which are the plant versions of animal cholesterol. Unlike cholesterol, phytosterols may help to reduce elevated cholesterol levels in humans. The bottom line is they're all good sources of protein, minerals, and healthy fats. You can spend the extra money for cashew and nut butter if you prefer the flavor, but you're not really getting added nutritional value for something that costs two or three times as much. You may need to be a little careful when you buy peanut butter because some brands contain added sugars that you don't need. Many supermarkets and health food stores have a bulk section where you can grind your own nut butters from their bulk nuts. This avoids any unwanted ingredients. At home, you can add salt and a little honey, sugar, or other sweetener if you desire. 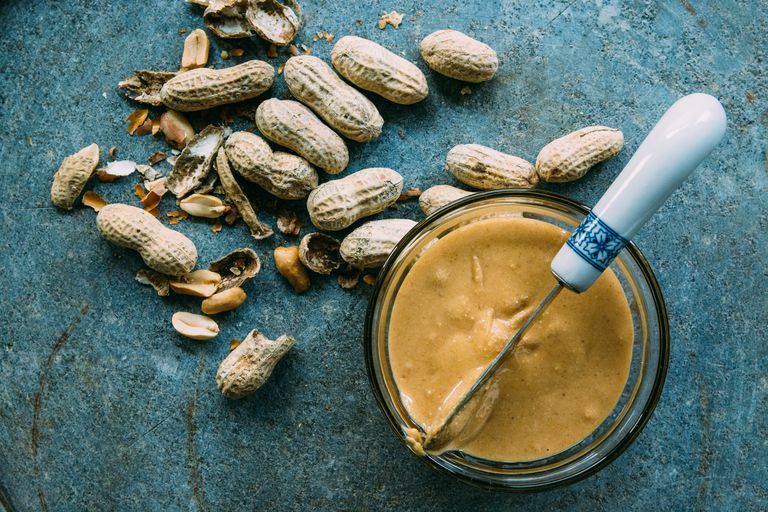 Note that people who have peanut allergies are at a higher risk for tree nut allergies, so almond butter or cashew butter may not be suitable substitutes. Speak with your healthcare provider if you or any of your family members have peanut or nut allergies. United States Department of Agriculture National Nutrient Database for Standard Reference, Release 27. "Peanut butter, smooth style, with salt." https://ndb.nal.usda.gov/ndb/foods/show/4811. United States Department of Agriculture National Nutrient Database for Standard Reference, Release 27. "Almond butter, smooth style, with salt." https://ndb.nal.usda.gov/ndb/foods/show/3768. United States Department of Agriculture National Nutrient Database for Standard Reference, Release 27. "Cashew butter, smooth style, with salt." https://ndb.nal.usda.gov/ndb/foods/show/3758.